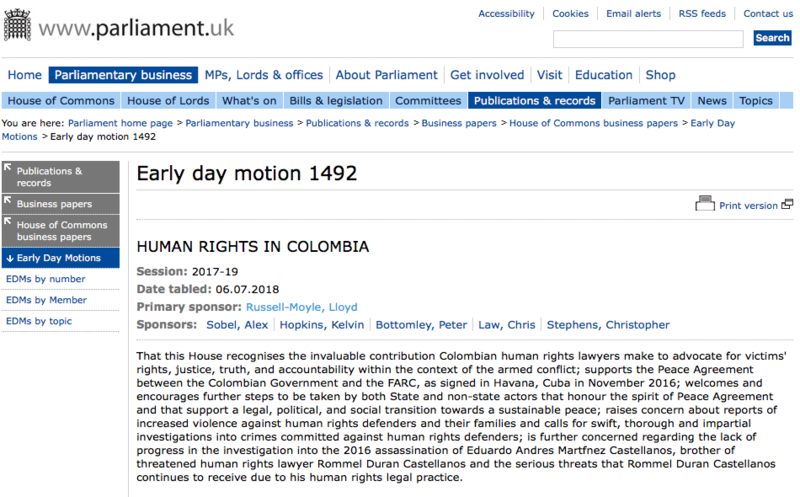 An Early Day Motion (EDM) has been tabled in the UK parliament which supports the Caravana‘s call to support the peace agreement and to protect lawyers, judges and human rights defenders in Colombia, given the concerning rise of violence against them. The EDM also calls for progress in the investigation into the murder of the human rights lawyer Rommel Duran Castellano’s brother, something that Rommel raised directly with the MPs he met with during his March visit to the UK with the Caravana. Please ask your MP to sign the EDM. An EDM is more powerful, the more MPs support it. Now is a crucial time for peace so could you please email your MP and ask them to support the EDM? A template letter which you can use to email or write to your MP is here. If you write to your MP, make sure you include your name, address and postcode so they can be sure you are a constituent, otherwise they might ignore your message. See sample letter to your MP here.